This is a story. 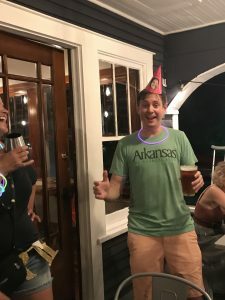 A story about how one night in Eureka Springs, Arkansas became two; celebrating birthdays with strangers became partying with friends; and how the Joy Motel became the Wanderoo Lodge. Tim Freeman, owner of the newly remodeled Wanderoo Lodge, was born for this job. Literally. His great grandparents were the original owners of Camp Joy, which eventually became the Joy Motel. The Joy is where Tim remembers swimming with his cousins in the pool. He grew up on this land, so it’s only natural that this Eureka native is the one remodeling and rebranding it after years of neglect. Of course, I didn’t really know any of this when I booked my stay there. Nor did I know that I had lived across the street from Tim 15 years ago in Fayetteville, AR. 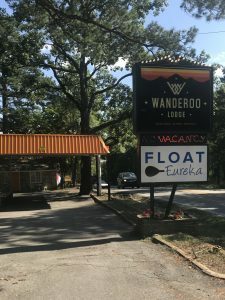 I booked my stay at the Wanderoo because that was the location of the Float Eureka office. Ozark Mountain Ziplines is also located on the property, but Henri said that sounded like a terrible idea. I reached out to Float Eureka to discuss a post for the blog. Rachel, one of the owners, suggested a comparison of standard vs inflatable boards when paddling with your dog. Great idea! I asked if I could also stay at the lodge. Thus, an adventure was born. I’m pretty sure this is the way it happened for Tim and his buddies who own Float Eureka. They’ve only known each other five years, but many travels, beers and conversations with the right people and awesome ideas are often born. Throw in a little kismet- the Joy wasn’t for sale when Tim first returned to Eureka looking for a place to buy, but soon went on the market- and wonderful things began to happen. The Wanderoo was meant to be. A river runs through it at the Gravel Bar. Check-in is at 3:00 p.m. We arrived around 4:00 p.m on a Friday afternoon just as they were putting the finishing touches on the opening-that-night Gravel Bar. I am proud to say I was the first person to order a glass of wine and I was standing right there when they flipped the switch on the ‘river’ inset into the bar top. 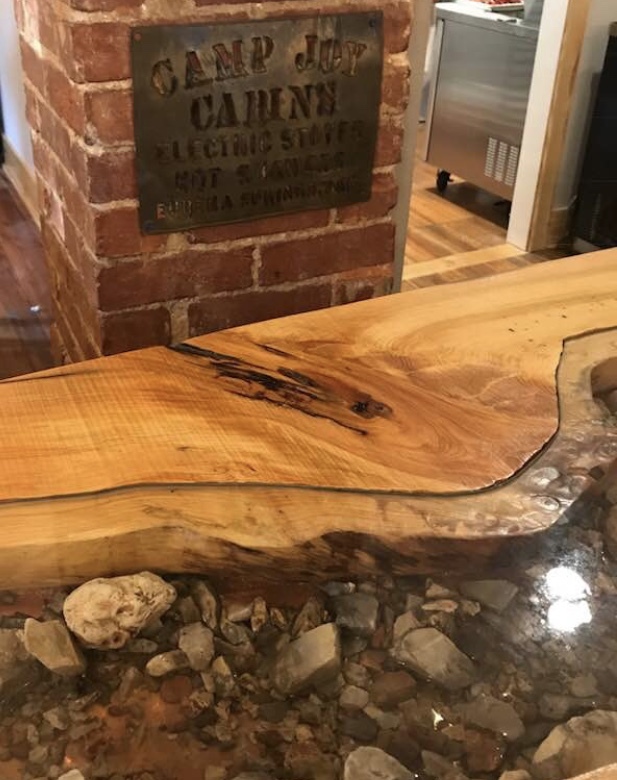 It’s a pretty fabulous piece of craftsmanship done by local, when you see his work you’ll call him an artist, Shaman Hill of Rustic Creations and Designs. Jinx does what Jinx wants. 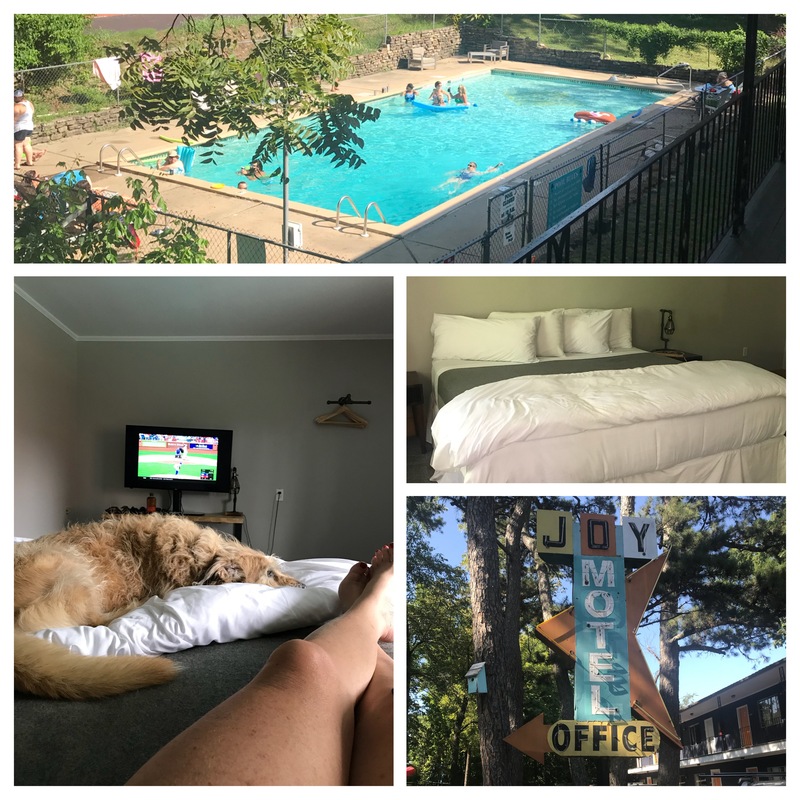 After my glass of wine on the dog-friendly porch, Henri and I strolled back to our room. Roaming off-leash without much notice from other guests, he casually followed behind me. As I approached my room, I noticed a cat sitting on top of my car. Seemingly lackadaisical, I hoped he was friendly. He was. 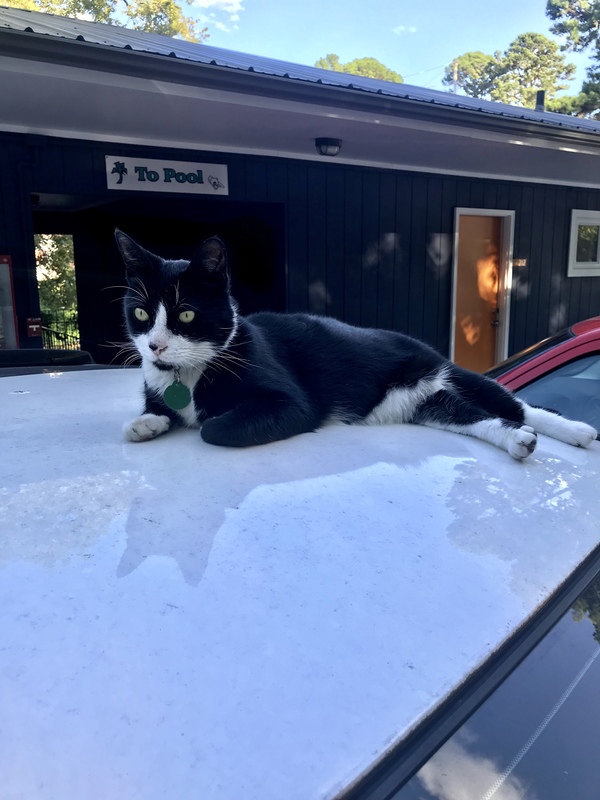 Jinx is the property cat and I guess he knew just who’s car to lay on ‘cause I had treats. I saw Jinx a few other times during our stay and I must say he’s pretty cool. He’s very social and friendly, and though he’s not afraid of dogs, he shows no interest in antagonizing them like some cats do. Jinx just goes about his business. Be sure you take him some treats. Had I known the Gravel Bar was opening Friday night, I wouldn’t have made dinner plans downtown. As it was, I’d promised some clients I’d meet them and their very well behaved dog- shameless self-promotion– at Local Flavor, a dog-friendly favorite of ours. The Wanderoo offers a $15/day shuttle to guests and since it runs until midnight, Henri and I took advantage of that. After dinner we returned to a bustling Gravel Bar and though opening night seemed a success, we called it a day. I didn’t want either of us worn out for our paddle the next morning. The King Wanderoom is sparse, but spacious and comfortable with a large window that overlooks a salt water pool. There’s no art on the walls, but you’ll enjoy the amenities of a mini-fridge, Keurig-style coffee pot, microwave, and flat screen TV. With one table and two chairs, and one additional chair, there was plenty of floor space for a slow 12 year old dog to do a couple of tosses of fetch. The bathroom is clean-lined with subway tiles and fluffy, white towels, and the king-sized bed was comfortable with plenty of pillows for a good night’s sleep. The King Wanderoom is perfect for a good night’s sleep or a baseball nap. Since the Gravel Bar doesn’t serve breakfast and I’d fed my dinner leftovers to Henri, after coffee we went in search of food. I was told there was a food truck across the street in the parking lot of the old high school, but fair warning…by attempting to get across that intersection, you will be keeping your angels busy. My breakfast sandwich with homemade sausage was pretty delicious, but I’m not sure it was worth the risk to life and limb. We were scheduled to meet Rachel from Float Eureka at their office, which used to be the check-in desk of the Joy Motel. Now that the big house is remodeled and the front desk located inside, the outfitter uses the space for their business. Check-out is at noon, so we did that before leaving. We inquired about keeping our room for one more night but unfortunately they were full. Fortune took a turn, however, and by the time we got back from our paddle a cancelation had opened a space for us. Since it wasn’t the haunted room (every place in Eureka has one), we happily accepted Tim’s invitation to stay another night. It was his birthday after all and opening weekend of his new bar. How could I say no? Dusty, the manager, even threw in a free t-shirt when I complained of not having enough clothes for a second night! FYI. That shirt is super-soft and now one of my favorites. It was 3 p.m. on Saturday afternoon with a paddle behind us, a night before us, and a comfy place to rest. This seemed like a good time for nap. We went to our new room, hit the air, turned on the Cardinals game, and promptly dozed off. After our snooze, I realized I hadn’t really planned Henri food for a second night. I needed to find a grocery store and this is the great thing about traveling with a raw fed dog. If he weren’t raw fed, he’d be on some fancy high dollar kibble that was only available via private shipping from a nunnery in Australia. As it is, a can of salmon and some green beans works just fine. It also gave me a chance to pick up some fruit and protein for my own breakfast the next morning. Hart’s Family Center isn’t a fancy gourmet grocer, but it was just down the road and met our needs. Owner, Tim, is ready to celebrate with his guests. With Henri fed and me showered and sporting my new Wanderoo t-shirt, we headed up to the Gravel Bar to see what was happening. A lot was happening and it was the perfect sampling of everything Eureka Springs is- friends, family, a former mayor, a manager who side gigs as an Elvis impersonator and his wife, a renowned crochet artist, a server who looks a whole lot like Hannah Montana but dresses like the Swiss Miss in combat boots and has the best color red lipstick you’ve ever seen, a school teacher, a few folks from here and there, a couple of dogs, and Jinx supervising from the front porch. At least two other birthdays in the house that night contributed to a mood that was festive and upbeat. Cake and homemade moonshine were being shared and laughter was abundant. The name had changed but the J O Y was still there. We arrived just in time to watch Tim blow out his birthday candles. As midnight and last call drew near, plans to head downtown to Chelsea’s started solidifying. I took Henri back to our room and jumped on the over-stuffed shuttle with my new assortment of friends. It continued to be interesting. Why quit now? If you are ever in Eureka, go to Chelsea’s. The music and the people are eclectic and generally great. Where else are you going to find a red-headed Dothraki and a Jersey Boy shooting pool together while a band by the name of A Ferocious Jungle Cat lays it down on stage? I eventually had my fill of entertainment and bummed a ride back to the Wanderoo. There were a few people in the pool, even though it was technically closed, but all was quiet. Snuggled next to Henri, my head hit the pillow and I quickly closed my eyes on another successful adventure. Sunday morning brought with it a cool drizzling rain. 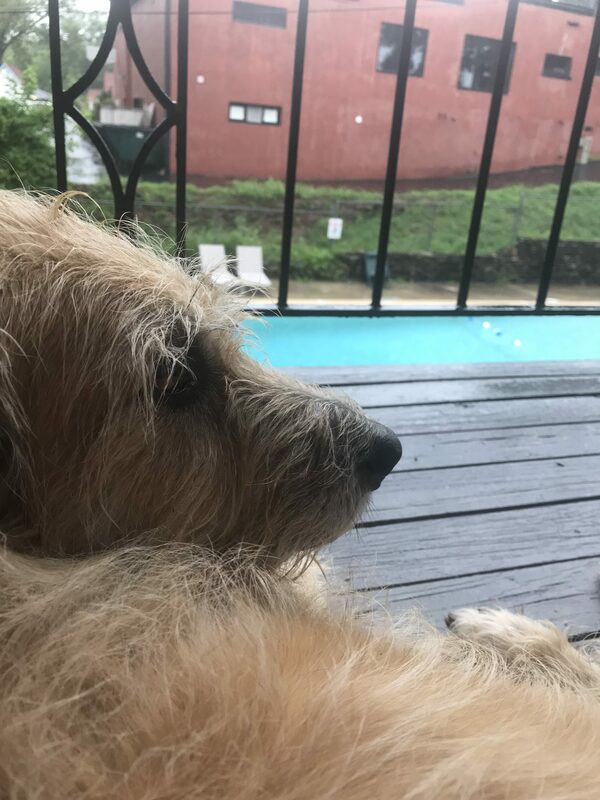 Henri and I sat outside the back door of our room watching the drops of water hit the pool while I drank my coffee and began writing some notes. What would I say about this adventure and these people..? We checked out of the Wanderoo on Sunday morning and headed to brunch at Oscar’s Cafe, where Henri was welcomed with a bowl of water and some bacon. If the gossip I overheard on the porch that morning is any indication, the people in Eureka are expecting great things from the new lodge. Supported by a solid group of friends and family, as well as a town eager to see the Joy resurrected, Tim has used his background in hotel consulting and love of Eureka to create a new vibe at an old place. I think you can expect the Wanderoo to continue to grow, branding itself as the in-town lodge that is your gateway to Ozarks adventure. That seems like pretty high praise to me and based on what I experienced, I couldn’t agree more! A note about the pet policy: There isn’t an official one. There are no breed bans or size limits. Well behaved pets can be left unattended in your room with or without a crate. They’ve accepted cats and parrots, as well as dog guests. If you visit with your pooch, don’t be the one who screws it up. Keep your furry friend under control, pick up your poop, and don’t chase Jinx! Shop downtown. Many of the shops are dog-friendly and have bowls on the sidewalk outside their doors. Visit Blackie’s Back Yard for pet-related gifts, toys, and treats. Have a sangria on the patio at Local Flavor. Dogs will need to go up the back stairs to reach the front patio or through the doggie gate to get to the side area. Yes, there’s a doggie gate! Visit Basin Park. From crafts to music, there’s almost always something going on there. Visit the Christ of the Ozarks statue. Weighing over 2 million pounds and standing 67 ft. tall Big Jesus has overlooked Eureka since 1967. Run off-leash at the Bark Park. Thank you for the lovely article on the Wanderoo. I’m Jinx’s mom. I think we met briefly on the grounds, and I seem to recall petting Henri. Definitely remember seeing you both on the porch. I do some occasional work on the grounds, but mostly look after the pool. I hope you’ll return again sometime soon. I’m also a writer, mostly a playwright, but I’d like to put together a little book called Travels with Jinx. He’s about 8 years old, came to me as a rescue in NYC and we’ve been together six years. He’s traveled and lived across the U.S. with me, and we’re hoping to go to Europe and the U.K. (those long horrible quarantines have finally relaxed) in the next couple of years. We came to Eureka and the then Joy Motel in May 2017. And we just stayed. Jinx is acknowledged all around as a very important staff member and ambassador of good will. One of the reasons I appreciate this mention in your blog is I have been collecting reviews and testimonials for Jinx as a guest and in general. I would like to begin going to longer stay writers residencies and retreats, but so many of them refuse to allow companion animals, despite all the evidence that they are emotionally beneficial to artists of all forms, add to their creativity — but unhealthy stress develops both ends when they are separated from their animals more than a couple of days. Anyway, thanks again. I hope we’ll get to meet and have a real conversation. In the meantime, I’ve posted this link to my Facebook page. Hi Liz! Thanks for reading and commenting. I’m so glad you said “Hello.” I think Jinx is just the coolest! I hope you don’t mind that I gave him treats. It was freeze-dried beef so he was pretty pleased with it. 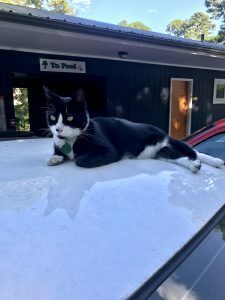 I know lots of hotels accept companion animals and could happily point you in the direction of some of our favorites, but I don’t know much about writer’s retreats. Good luck in your writing and travels, and if Jinx ever needs a reference, feel free to let me know! Hi Michelle! We know the feeling! At 48 lbs, Henri is sometimes above limit too. We also avoid places that require the dog be in a crate in your absence and places that don’t allow your dog to be left unattended in the room. We have some favorites we’d be happy to share if you ever need suggestions. thanks for reading and Happy Tails to you!